It was a return to fantasy normalcy in Week 4 for the most part, as many former first-round picks ruled the day. Alvin Kamara, Ezekiel Elliott, Todd Gurley, Melvin Gordon, Julio Jones, and DeAndre Hopkins were all huge, but the passing frenzy continued to steal the show. Somehow the star of the day was Mitch Trubisky. 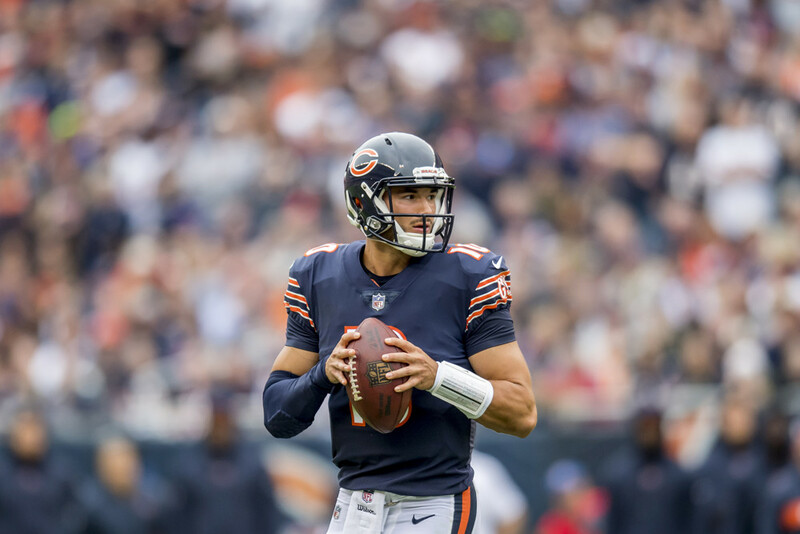 After throwing for 7 TDs all last season, Trubisky had 6 on Sunday alone. He wasn't the only recent high draft pick to show out. Jared Goff was a Thursday night monster with 465 yards and 5 TDs. Derek Carr and Andrew Luck added big Sundays as well, each going for over 400 passing yards and 4 TDs in overtime games, and Luck even threw his own Hail Mary! Kirk Cousins, Matt Ryan, and Andy Dalton had 3-TD games too. Drew Brees was the big QB dud this week. After several huge weeks, he was a miss against the Giants with just 217 yards and no TDs. This may also be the end for FitzMagic, as Ryan Fitzpatrick struggled to 126 yards and an interception and was benched at halftime in a blowout. Russell Wilson continued to struggle as well. He was also held out of the end zone and failed to reach 200 yards. It was a good week to have spent a first-round pick on a stud RB. Alvin Kamara continued to put up monster numbers with 134 yards and 3 TDs on the ground plus his usual damage in the air. Ezekiel Elliott had 240 combined yards and found the end zone, and both Todd Gurley and Melvin Gordon cleared 150 combined yards and scored. It was also a big week for New England running backs. Both Sony Michel and James White had 112 yards, and the duo combined for 3 TDs. Gio Bernard had a pair of scores too. It was a rough day for RBs returning from injury. Leonard Fournette had only 30 rushing yards in his return and left hurt again, and Dalvin Cook struggled with just 20 yards in limited playing time. LeSean McCoy had only 8 touches for 37 yards in a shutout. Jordan Howard had 11 carries for 25 yards and saw Tarik Cohen steal time with a big day. Kenyan Drake and Isaiah Crowell were complete busts with just 3 yards each. James Conner looked so promising Week 1 but disappointed again with just 19 rushing yards. There were a ton of big WR days, begun Thursday when Cooper Kupp, Brandin Cooks, and Robert Woods each had 100 yards and a TD. Golden Tate and Taylor Gabriel each had over 100 yards and a pair of TDs Sunday, while fantasy first rounders Julio Jones and DeAndre Hopkins each had over 160 receiving yards. Corey Davis did too in a breakout effort, and he caught the game-winning TD in overtime. Rookie Calvin Ridley had a second straight big game with a pair of TDs. Well, Michael Thomas couldn't keep that pace up forever. He had only 4 targets, though he did catch them all for 47 yards. Larry Fitzgerald was silent again with just 3 catches for 28 yards, and Marquise Goodwin had a pair of catches for 24 yards. George Kittle was this week's stud TE with 125 yards and a long TD, showing off his connection with new 49ers QB C.J. Beathard after their days together at the University of Iowa. Zach Ertz finally got going with 10 catches for 112 yards. Rob Gronkowski disappointed for a third straight game with just 44 yards and left injured, and he could be in doubt for Thursday night. O.J. Howard was held catchless in the Bucs dud.